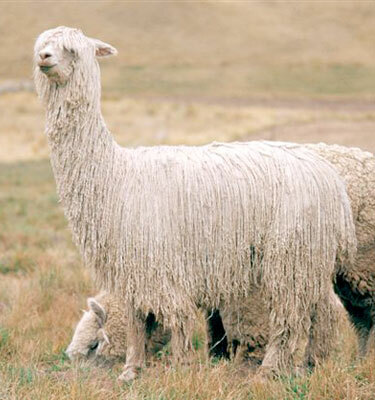 ALPACA hair comes from just one of the species of the South American Camalidea, which differ greatly in appearance from the Afro-Asian Camel or Dromedary. However all are cud-chewing animals, which characteristically kick and spit fetid saliva, or undigested food when irritated. All have similar feet, well suited for walking on soft sand, moss or very fine grasses. 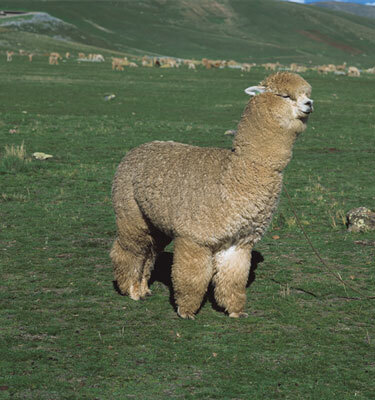 The Alpaca lives in the South American Andean region at altitudes as high as 5000 meters where it needs a thick fleece or coat to keep out the cold. 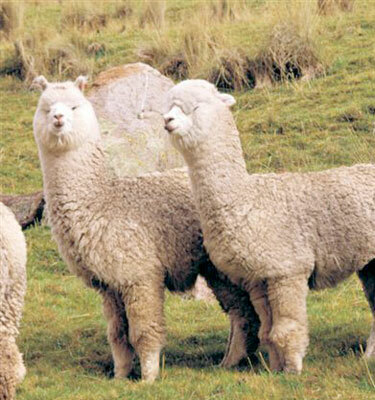 They are domesticated animals and together with the LLAMA, have lived with man from time immemorial, highly valued for their fibre and meat. 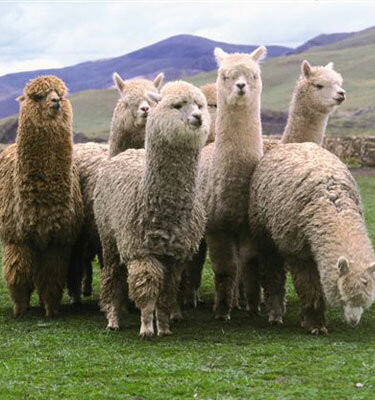 The ALPACA is a smaller version of the LLAMA and it is used mainly for food and clothing, whilst the larger heavier LLAMA is also used as a pack (load bearing) animal. 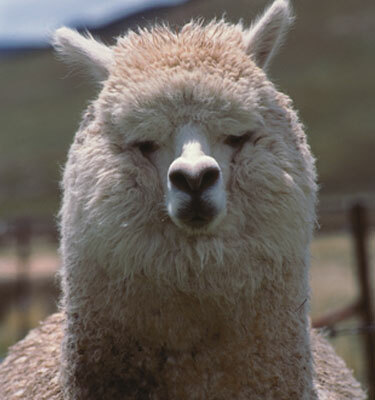 Alpaca’s can be split into two sub-breeds, the HUACAYO, which is the most numerous and represents about 90% of all the existing animals and the SURI making up the other 10%. 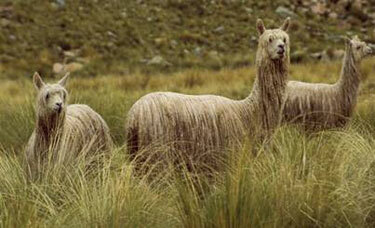 The Huacayo is more like the Llama in appearance, though slightly smaller with thick wavy hair covering most of the body. In contrast the Suri has long silky lustrous hair, which is very compact and more highly valued. 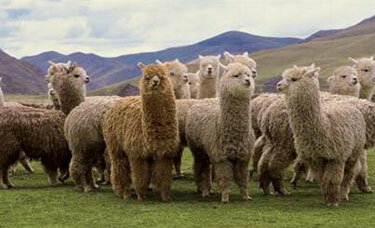 Alpaca farms are of various sizes. Generally, an Indian family will look after their own herds, rebanos, according to primitive breeding methods, handed down through the ages. Fertility is low and barely 50% though with richer nourishment and a lot of care this can be increased to 75-77%. They have only one animal per birth and quite often the newborn perish if the weather in the mountains turns particularly cold or wet, as is often the case. The hair of these animals can be very fine, as low as 17/19 microns on a newly born, though the bulk when shorn tends to be 21/23 microns. Adolescents have a bulk fleece of 24/28 micron whilst the older Adults tend to be coarser running off from 31/35 micron. Fibre colour comes in a variety of 14 natural shades ranging from almost pure White through Cream, Beige, Fawn, Brown, Chocolate, and Steel Grey to the occasional pure Black. However, it is important to take note that over 80% of all the animals today are White, Off White or Cream and some of the darker colours such as Black represent a very, very small percentage indeed. 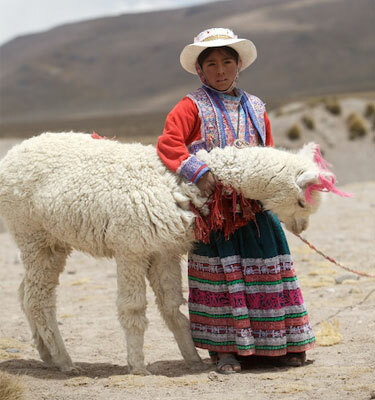 The flesh of the ALPACA is considered valuable and in ancient times it was reserved like the VICUNA for the Inca imperial family. 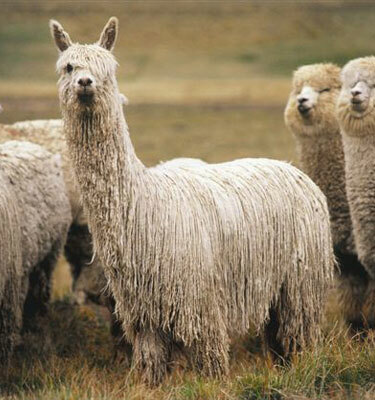 LLAMA is a slightly different and larger animal with hair that is rather coarse at 27/38 microns, except on the very young baby animals. 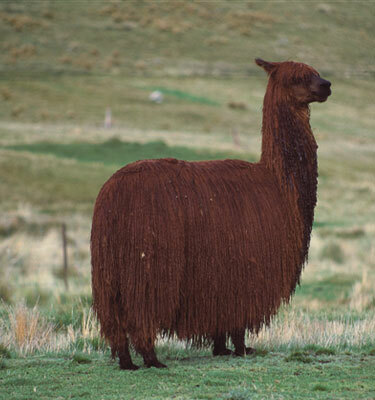 Like the Camel it tends carries a stronger outer hair, which is difficult to separate and does not grow are so many rich, solid colours as that of the Alpaca. The animal is much heavier and in the past this constituted a very important means of transport throughout the Andean chain of mountains in Peru and into Bolivia, where most of these animals live. 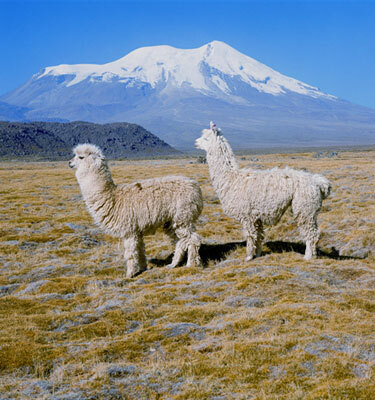 Bolivia has far more Llamas than Alpacas and approximately 60/80% of all Llamas are to be found here, with a number also in Chile and Argentina. The animal is very versatile and used for carrying goods, while the flesh is used for food, the hair for clothing and blankets, the skin produces excellent leather and is used for making everything from wineskins to shoes, whilst the excrement, in a dried state is used as a foul smelling fuel for heating and cooking. 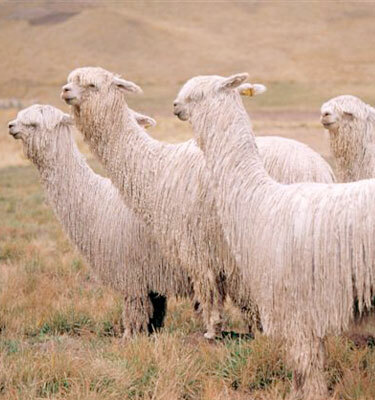 Both Alpaca and Llama hair is widely used in the textile world, designers like it for the many natural colours, which do not need to be dyed and for its soft warm handle. Used in many ways from garments to blankets, it can be dyed much like wool in a variety of rich deep colours.